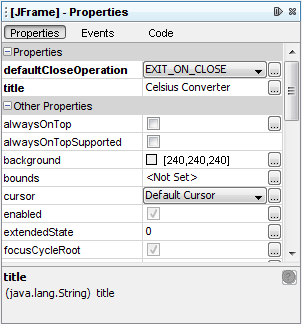 This section explains how to use the NetBeans IDE to create the application's GUI. 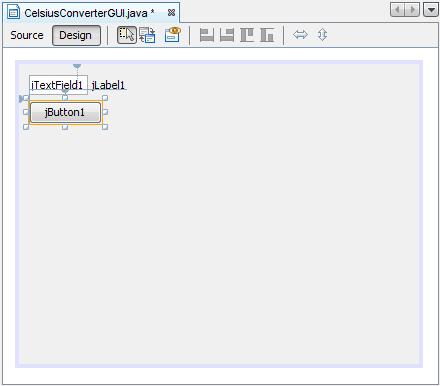 As you drag each component from the Palette to the Design Area, the IDE auto-generates the appropriate source code. You can set the title by either double-clicking the title property and entering the new text directly, or by clicking the button and entering the title in the provided field. 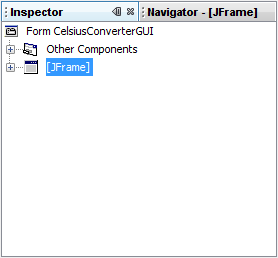 Or, as a shortcut, you could single-click the JFrame of the inspector and enter its new text directly without using the property editor. 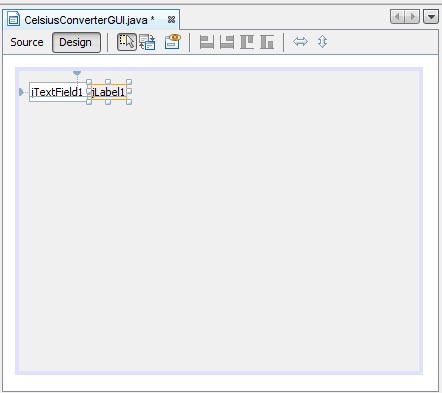 You may be tempted to erase the default text "JTextField1", but just leave it in place for now. We will replace it later in this lesson as we make the final adjustments to each component. For more information about this component, see How to Use Text Fields. Next, drag a JLabel onto the Design Area. Place it to the right of the JTextField, again watching for visual cues that suggest an appropriate amount of spacing. 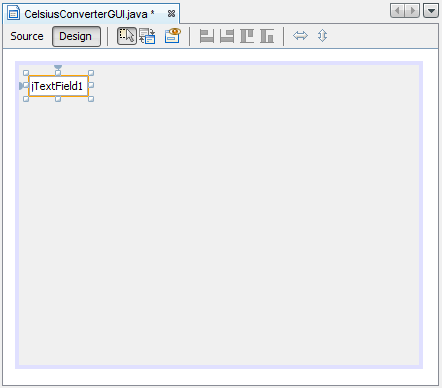 Make sure that text base for this component is aligned with that of the JTextField. The visual cues provided by the IDE should make this easy to determine. For more information about this component, see How to Use Labels. 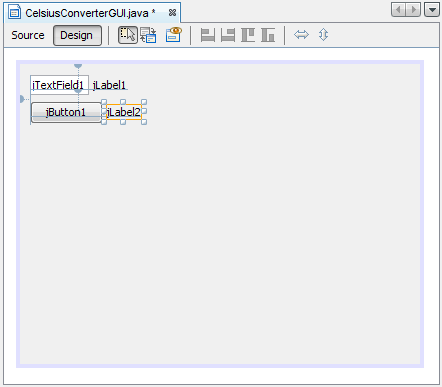 Next, drag a JButton from the Palette and position it to the left and underneath the JTextField. Again, the visual cues help guide it into place. You may be tempted to manually adjust the width of the JButton and JTextField, but just leave them as they are for now. You will learn how to correctly adjust these components later in this lesson. For more information about this component, see How to Use Buttons. Finally, add a second JLabel, repeating the process in step 2. Place this second label to the right of the JButton, as shown above.